LGB was an early adopter of DCC, although they gave their own "twist" to it and called it MTS, Multiple Train system, and historically it has had a number of limitations. But early LGB locos can be difficult to use with DCC, since some of the motor blocks have 3 wires instead of the 4 you need for any decoder installation. 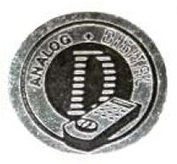 The way DCC decoder (or similar technologies) is made, is that the track power is picked up from the wheels or sliders, rectified (changed to DC). This fixed polarity DC is now used to power the microprocessor (brains) of the decoder and the output transistors that run the motor, as well as lights, sound, etc. So, think of the track as a "raw" power supply, and then the decoder makes a "refined power" supply for itself, and then from this refined supply, it controls the motor. If you have a short circuit between the "raw" and "refined" power supplies, it causes a big problem, normally instantly destroying the transistors that run the motors. This is the most common mistake people make installing decoders, and the main cause of damaged decoders. LGB locos newer than 2006 should all be DCC compatible, although you will have to navigate various connectors and plugs. I'm not an expert on all the variations, but Dan Pierce at Train-Line_USA (formerly Train-Li) can advise what connectors and cables are needed. The important fact is that the motor blocks have the 4 wires you would expect, 2 for track pickups and 2 for motor leads. The 3 wire motor blocks have one of the motor wires already connected to one of the track pickups internally. Often the 3 wires are white, green, brown. This will usually cause INSTANT destruction of any decoder, until you "break" the one motor wire connection from the track pickup. For locos built before 2006, you need to check for compatibility. There are clues you can follow. Early on, there was a "D" impressed into the bottom of the motor block casting. This indicated that this was a 4 pin motor block. Other clues are various stickers applied to the motor block usually on the bottom. 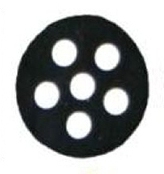 The sticker with 5 white circles in a pentagon indicates a 6 pin decoder interface. An interface cable (Massoth 6-pin Interface cable, item # 8312061) is required to connect a decoder to the locomotive's PCB board. The 6-pin decoder interface is plug-and-play compatible with the LGB® 55020, 55021 and Massoth L decoder. 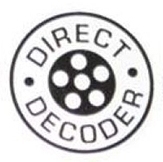 The sticker with a smaller verision of the pentagon, surrounded with the words: "direct decoder" indicates a 10 pin decoder interface plug-and-play compatible with the LGB® 55020, 55021, and the Massoth L decoder.. The decoder plugs into the main board and you trim the 4 wires (2 track and 2 motor) off the decoder. 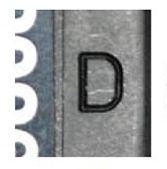 Another sticker with a "D" in the background with an MTS decoder in the foreground, this indicates that this loco is already equipped with an onboard-decoder (need list of ones used) that is suitable for both digital and analog operation. I'll try to add pictures here, but in some cases you can open the motor block and add some insulation to a connection to "break" the connection, and then you will need to solder a new wire to the "disconnected" motor lead. Now I learned a few more things. the LGB motor block has 3 pins in it, two outer ones, and one more nearer one of the outer pins. 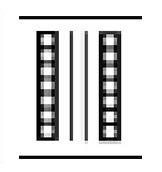 1 is white and is the left hand rail pickup. The motor also seems to be connected to it.